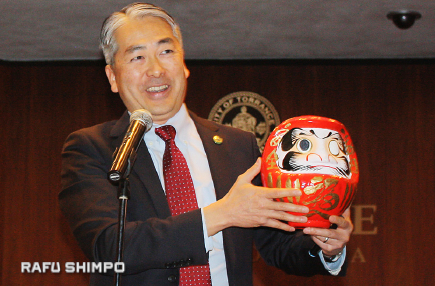 TORRANCE — When he started his bid to regain his Assembly seat, Al Muratsuchi did a very Japanese American thing. He inked in one eye of a daruma, symbolizing a goal yet to be accomplished. On the morning of Feb. 11, with the help of his daughter Sophia, Muratsuchi inked the second eye before a large gathering at Torrance City Council. “The daruma is a symbol of perseverance. I colored in that first eye when I kicked off our re-election campaign in 2014 and so the second eye was left uncolored for the last two years,” Muratsuchi said. 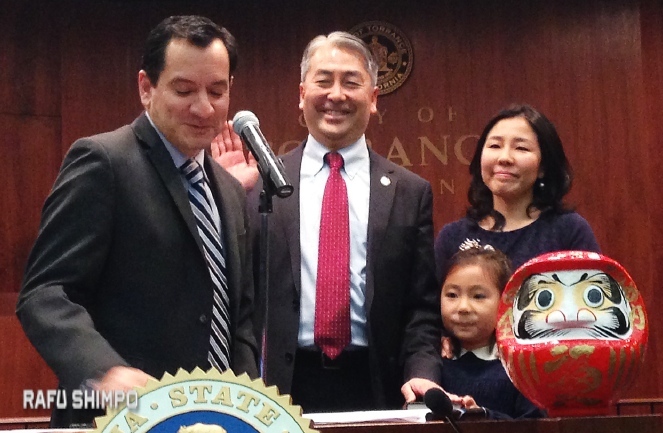 Muratsuchi returns to state politics as the lone Japanese American in the State Legislature. He is chair of the Joint Legislative Audit Committee and serves on the Appropriations, Natural Resources, Utilities and Energy, and Veterans Affairs committees. The community swearing-in celebration was an opportunity to thank supporters. Elected officials in attendance included Assembly Speaker Anthony Rendon, Los Angeles County Supervisor Janice Hahn and Torrance Mayor Patrick Furey. Asano Taiko started the ceremony off with an energetic taiko performance. Muratsuchi’s victory in November over Republican incumbent Assemblymember David Hadley was a bright spot for local Democrats following the election of Donald Trump. “As the only Japanese American in the State Legislature, I feel a special obligation to represent not only my district in the South Bay but to represent JAs throughout the state of California,” he said.